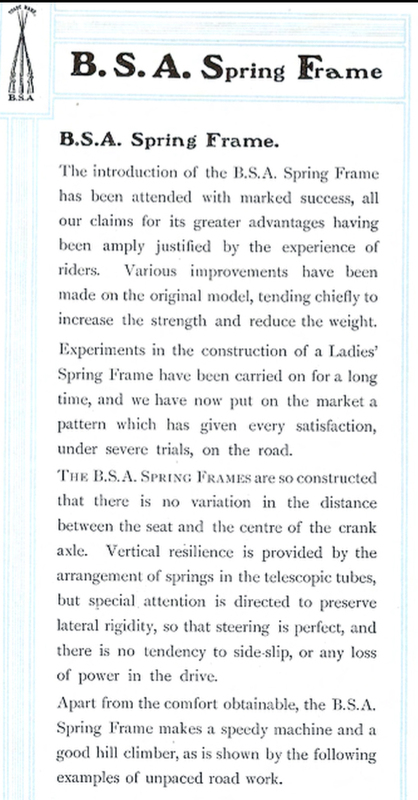 The BSA Spring Frame was received with much acclaim at its launch in 1900. Of all the bicycles featuring springing in its frame or forks, the BSA Spring Frame was by far the most successful. The BSA spring frame also seemed ideal for mounting an engine. The 1904 example pictured below, fitted with a 1903 Minerva engine, is a typical early motorcycle assembled in Australia. The high quality of BSA fittings and, even more important, their consistent high quality, allowed frame builders to sell BSA Fittings Machines as their own. This was a perfect arrangement for a country such as Australia. 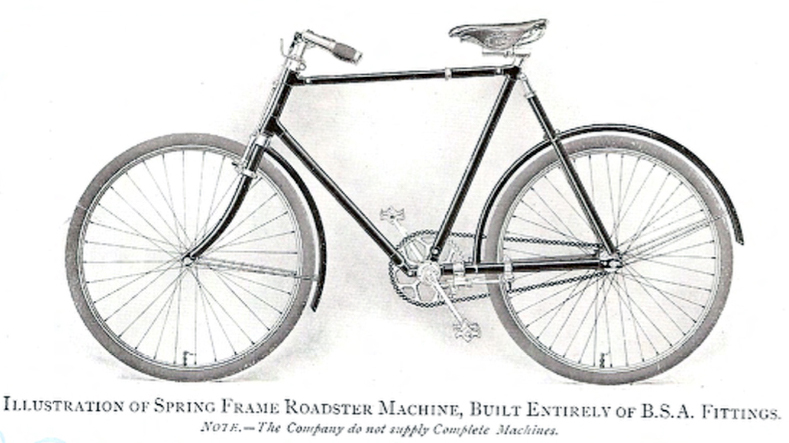 Of course, BSA Spring Frame bicycles were also popular machines without engines fitted. When Francis Birtles set off across Australia on his famous cycle journey, it was a BSA Spring Frame that he selected for the journey. The Spring Frame is the rarest and most sought-after BSA model of the twentieth century. Normally, the company supplied fittings rather than complete machines; a frame builder could buy all the components required to build a BSA Fittings Machine himself. However, the Spring Frame was sold including the frame, for a trade purchaser to assemble to their customer’s requirements. Exported spring frames were sold totally in component form, in order to avoid import tariffs in the destination countries. This example, featuring BSA’s patent backpedal brake, is in sound condition all-round. There is some play in the pivot bushes, and one of the original handlebar grips is damaged, but still usable. It has been recently fitted with tyres and tubes and is ready to ride. As you can see in the photos below, the BSA ‘three rifles’ logo can be seen on components all around the bicycle. On 26 December 1905, Birtles left Fremantle, Western Australia to cycle to Melbourne, an achievement which attracted widespread attention as it was the first west to east bicycle crossing of the country. After a short stretch as a lithographic artist, in 1907-08, he cycled to Sydney and then, via Brisbane, Normanton, Darwin, Alice Springs and Adelaide back to Sydney, where he based himself. In 1909 he published the story of his feat, ‘Lonely Lands’, which he illustrated with his own photographs. That year he also set a new cycling record for the Fremantle to Sydney continental crossing. In 1910-11 rode around Australia. In 1911 he was accompanied from Sydney to Darwin by R. Primmer, cameraman for the Gaunt Company: the resulting film ‘Across Australia’ was released the following year. Birtles had continued on to Broome and Perth, then broke his previous records by riding from Fremantle to Sydney in thirty-one days. By 1912 he had cycled around Australia twice and had crossed the continent seven times.